When I picked up my shirt at the Mending Project it came with an extra gift: a saftey pin that was holding the name label to it. A nice, reusable exta! 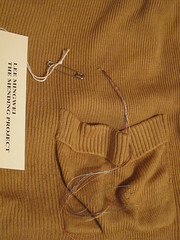 Lee Mingwei's mending was also much admired in the office on Monday. On the way to Liverpool I was working on another secret project (yes, that does mean the other secret project is done!). It struck me that my fellow passangers who were using their phones had much the same pose as me, attention focused on small movements of their hands. Interesting. Once this second secret project is done, it's back to mending the Made Do and Mend bag. Then it will be the mermaid story. Both before the holiday break. I feel tired already.